"This is my second finish here and I really like it. You have to focus on the uphill, then try to recover a little bit, and then the timing is important because it is slightly downhill after that. It worked out perfectly for me." Etixx - Quick-Step rider Gianni Meersman was victorious in a bunch sprint finale of an up-and-down, 166.7km Stage 1 of Volta ao Algarve on Wednesday. A four-rider breakaway was caught with about 16km to go in the stage from Lagos to Albufeira, after gaining more than a seven minute advantage early in the stage. Meersman was able to win on a finish that included a slight uphill before the line. He won the stage ahead of Ben Swift (Team Sky) and Paul Martens (Team LottoNL-Jumbo). Zdenek Stybar and Michal Kwiatkowski also placed 5th and 9th, respectively. 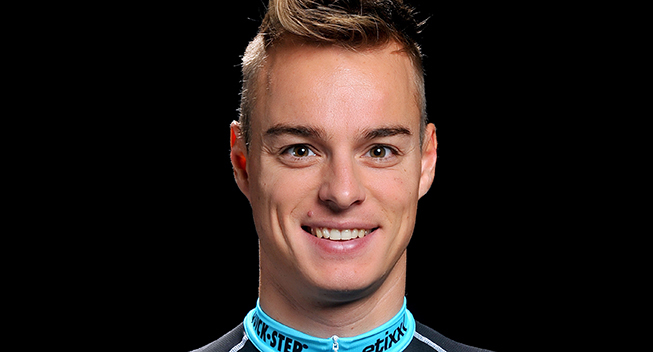 This is the second win for Meersman in 2015, and the 11th in three disciplines (10th road) for Etixx - Quick-Step in 2015. Meersman also won the 2012 stage that finished in Albufeira. "I was 20th position or something, but I stayed calm because a lot of guys were going full gas into a headwind," Meersman said. "You can never hold that kind of effort for long into a headwind. So I moved up a little bit, and then at the top of the uphill part of the finish they slowed down a little bit. I accelerated at that point. Kwiato looked behind and saw I was there, and he immediately took me to the front together with Styby. "So, it was Kwiato, Styby, and me, and it was full gas to the finish. Even at 200 meters to go I was 3rd position and I just went as hard as I could. I knew it was the right time. So I went and I got the win. "This is my second finish here and I really like it. You have to focus on the uphill, then try to recover a little bit, and then the timing is important because it is slightly downhill after that. It worked out perfectly for me. "From the first kilometer the whole team put their confidence in me. Petr Vakoc and Julien Vermote were riding all day in the front into a headwind. Chapeau to them. Then the other guys, Michal Golas, Yves Lampaert, Tony Martin, and obviously Styby and Kwiato brought me to the finish. It was really good team work. "I've participated in a few races and already won two. After Australia I had a small break of about a week and then I went immediately to Calpe to train hard. I then flew from Calpe to Portugal with the objective to try and win the first stage, and it worked out. I am really glad I am in good shape and could immediately finish the preparation with a victory. "This victory is dedicated to my family who misses me a lot, but when I win they are really happy. I also dedicate this victory to Claude Criquielion, who died today at 58 after a bad stroke. I didn't know him personally, but know he was a big champion and I dedicate this to Claude and his family as my condolences. It is a sad day for Belgian cycling."